There are 195 occurrences of the Hebrew word ‘adoni’ which means “my lord” (title) in 163 OT verses (root word: adon, Strongs # 113). They establish that the title 'my lord' is solely a non-deity title (it is never applied to God). It is ascribed to the Messiah in Psalms 110:1 (“Jehovah said unto my lord..”), and is the basis upon which Jesus is proclaimed lord throughout the New Testament. In Acts 2:32-36 Peter cites Psalms 110:1 in his declaration that God hath made Jesus both lord (adoni) and Christ. In contrast,the Hebrew word Adonai (Lord) is the exclusive title of God (“the Lord God”) and occurs 434 in the OT Scripture. He is the Supreme Lord. God’s prophet used simplicity in differentiating Adonai as “Lord” with a capital “L”, and adoni as “lord” with a lowercase “l”. The use of these Hebrew words in the Scriptures he cited unequivocally affirms his acknowledgement of the two Lords respectively. It is abundantly clear that he recognized Jehovah (the Father) as the only Lord God and as Abraham bore the non-deity title of ‘my lord’ so does his son in the fulfillment of Ps. 110:1.. ‘Jehovah said unto my lord…’ Thus the true doctrine according to the Scripture reestablished by the Message is One Supreme Lord God and one Lord Messiah just as Bro. Branham and Bro. Vayle have brought to the bride in the restoration of the Apostolic faith. Those that reject the truth concerning the Father and Son show they have never been restored back to the faith of the Fathers and do not have a true baptism of the Holy Ghost. Bro. Vayle corrected the fallacy of the word ‘L-O-R-D’ being substituted for Jehovah (2000-0304), afterwards (2001-0505) he reminds us that Jesus is a lord, but Jehovah is the Supreme Lord. This simply affirms the Scripture and Bro. 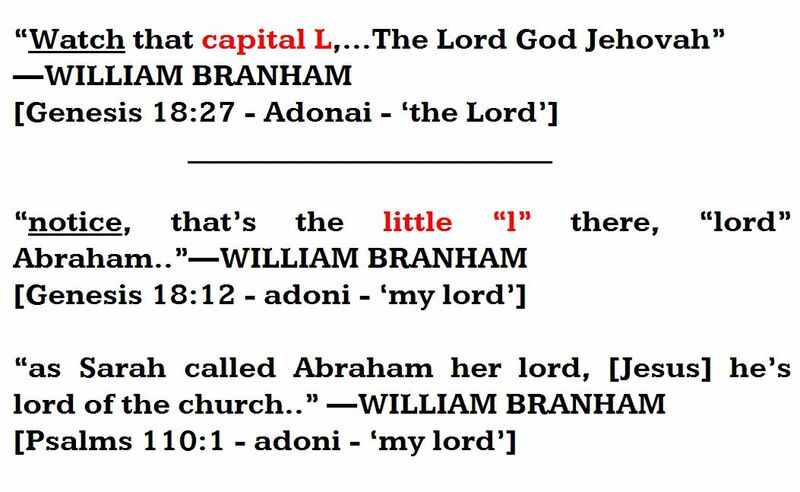 Branham’s teaching thereof—that Jehovah is the Lord (Adonai) God (“capital L”-WMB) while Jesus is lord (adoni) Messiah (“little l-o-r-d”-WMB).